Charlie Allison sends us this snippet from the Sunday Post, the most widely-read Sunday paper per head of population in the world. 'Copies are also mailed to expatriate Scots all over the globe,' he tells us. Mike Masterton kindly transcribed the article for us. My favourite song of all time is A Whiter Shade of Pale by Procol Harum. What's the story behind it? The lyrics came from a poem by Keith Reid, who, although not a member of the group [sic], wrote many of their songs. The words are thought to be a take-off of psychedelic songs of the time. Keyboard player Gary Brooker wrote the music, which was inspired by a piece of classical music entitled Sleepers Awake, one of the movements in Bach's Suite No 3 in D Major. 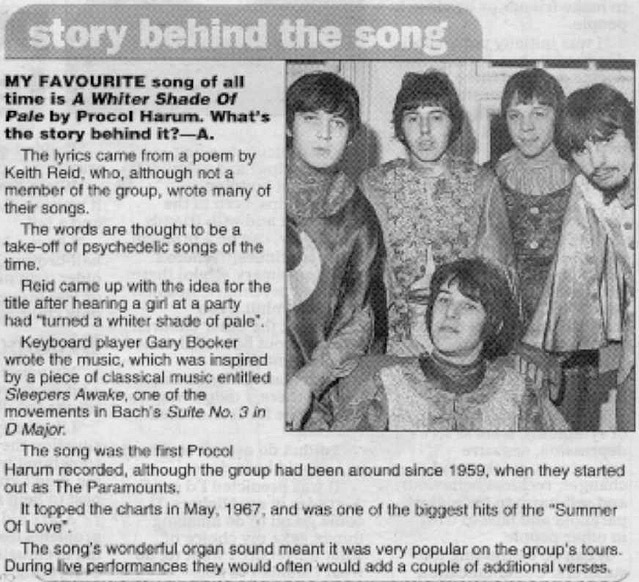 The song was the first Procol Harum recorded, although the group had been around since 1959 [sic! ], when they started out as the Paramounts [sic]. It topped the charts in May 1967, and was one of the biggest hits of the "Summer of Love". The song's wonderful organ sound meant it was very popular on the group's tours. During live performances they would often would [sic] add a couple of additional verses.